We all know moving can be stressful and overwhelming, especially if you are relocating to a new city. Here at Camden, we try to make transferring to your new home easy. Just stop by your leasing office and our wonderful Camden team members can help make your transfer as smooth as possible. Welcome to Central Florida, the heart of the Sunshine State! Filled with white sandy beaches, sunny days, an eclectic mix of culture, food, people and of course Mickey Mouse. Come see why Central Florida is the place to call home! Camden Bay – Drop your kayak in off the boat launch and explore the mangroves right next to our beautiful community on the Hillsborough River. You will love living right on the river and relaxing in our two pools. Camden Montague – Located minutes away from the Veteran’s Expressway, Tampa International Airport, Clearwater and area beaches, downtown business districts and local shopping plazas. It is the perfect central location in Tampa. Camden Pier District – Downtown St. Petersburg is the place to be. Enjoy the Saturday Farmer’s Market or take in a Tampa Bay Rowdies game. Just step outside Camden Pier District and you are right in the middle of all the excitement that is DTSP. Camden Preserve – Right near the heart of the lively South Tampa neighborhood and near the Tampa Bay Riverwalk. You are so close to great bars, restaurants and boutique shops. We are also just minutes from MacDill Air Force Base. Camden Royal Palms – Conveniently located near 1-75 and the Crosstown Expressway, Camden Royal Palms is an easy drive for any commuter. Endless entertainment and dining options are just minutes away, including Winthrop Village and the Brandon Town Center. Camden Visconti – Hit a few balls at Top Golf or play at Dave & Busters - both are only minutes away. With close access to the Crosstown Expressway and I-75, you can get anywhere in Tampa in minutes. Camden Westchase Park – Located in the family friendly desirable neighborhood of Westchase. With premier schools and all your everyday needs within the neighborhood. Publix, yummy restaurants, bars and parks are all nearby. Camden Orange Court– Urban apartments located in Downtown Orlando. Just a quick walk to Church Street Station and equipped with a saltwater pool! Camden North Quarter – Also Downtown, walking distance to Lake Eola, dining, drinks, & entertainment. Enjoy the views with their rooftop pool and amenity area! 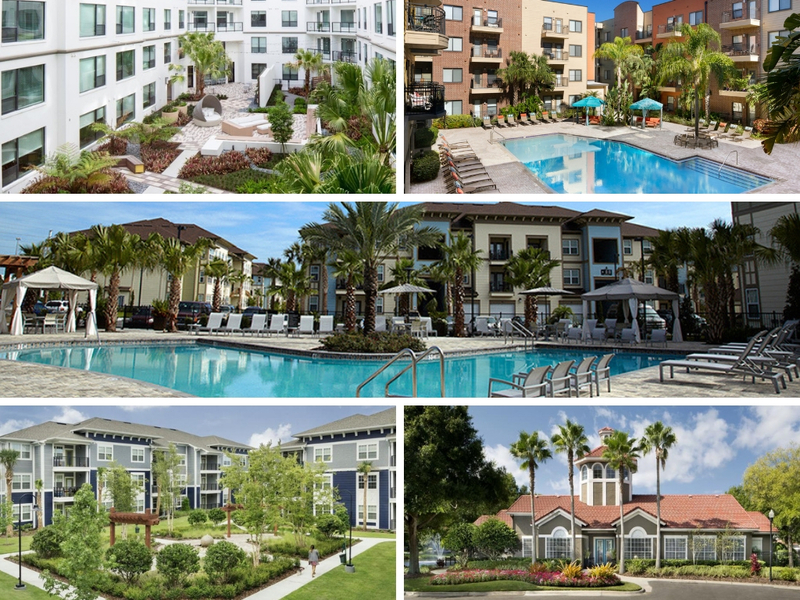 Camden Lee Vista– Roughly 5 minutes from the Orlando airport! It’s even walking distance to the Lee Vista Promenade which has Epic Movie Theater and shopping! Camden Lago Vista – Also roughly 5 minutes from the airport. Extremely close to major roads including SR 408, SR 417, SR 528, and I-4; making traveling a breeze! Camden LaVina – In the “Lake Nona” area featuring a short drive to the airport, and Medical City. This is a new-innovative area that features several options for food, drinks, and fun! Camden Waterford Lakes – Walking Distance to the Waterford Lakes Town Center for all of the shopping you need! It’s also located about 15 minutes from the University of Central Florida – Go Knights! Camden Hunter’s Creek – Super close to shopping; The The Loop and The Florida Mall are just minutes away! This area is also home to some of the top rated schools! Camden World Gateway – Love Disney? This community is only three minutes away from its entrance! It’s just as close to Disney Springs, which has unique dining, shopping, and lively entertainment. Seeing a trend here? Camden Town Square – Also located less than 5 minutes from Walt Disney World, this community is close to Celebration, FL. A must-try is the Celebration Town Tavern, a local favorite. You never know where life may take you, but with Camden’s Transfer option you’re sure to be in good hands! Don’t forget to subscribe above so that you can see other locations that Camden has to offer! This blog was co-written by Amy Kirby and Rachel Anderson, who proudly call Central Florida home.